Updating projects to Adobe Captivate 2017 will, for the most part, be troubleless. However, it can go wrong in some cases so here are some best practices. ALWAYS make a backup of your Captivate file before you upgrade it. On the Adobe Captivate forums, there are many examples of people that updated their original project file to a newer version of Adobe Captivate and saved it by overwriting their existing version. This is a bad approach if your project file becomes corrupt or some of your slides or functionality suddenly don’t work anymore. 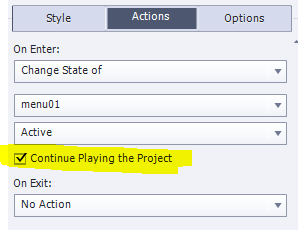 If you upgrade project files from versions older that Adobe Captivate 9 and have slides that use an “On Enter” action, you will need to manually set these to “Continue Playing the Project”. Otherwise, your project will get stuck on these pages. If your project contains third-party widgets, double-check that these work as changes in Adobe Captivate may have caused the widgets to not function anymore. If you experience problems with widgets, try re-inserting them in the new project file. Publish your project and go through it slide by slide to ensure that all your functionality works as it should. Do you have any tips or additions to this checklist? Let me know in the comments and I’ll add them in the post.